Its a Wonderful Movie - Your Guide to Family and Christmas Movies on TV: ION's 2016 Christmas Movie Schedule! ION's 2016 Christmas Movie Schedule! Which new ION movie do you most want to see this year??? "A Vermont Christmas Vacation," "A Firehouse Christmas," "A Cinderella Christmas," "Christmas With the Andersons" or "A Husband for Christmas"??? 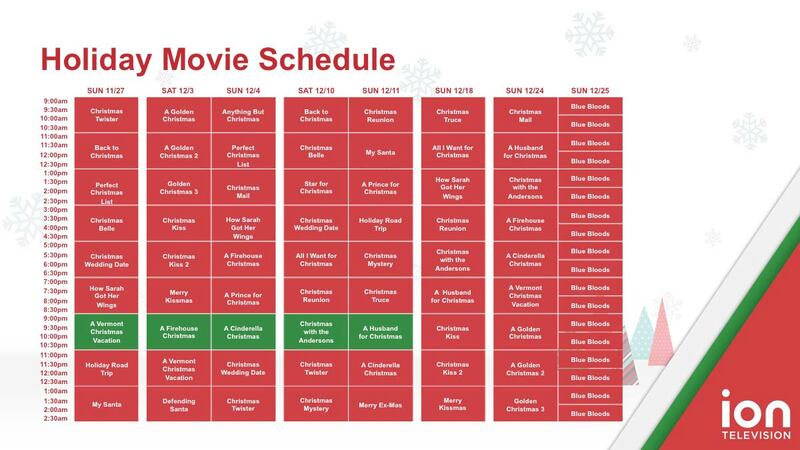 The Christmas TV Schedule has been updated with the ION Christmas Movies!!! Christmas With the Andersons will be on ION even though they are already on DVD? You should check out Love Always, Santa on Hallmark Movies and Mysteries! I wouldn't get my hopes up too much about ION movies. They are usually a miss for me, but for the mystery one done a couple of years ago. Wish they did a sequel to it. Am I forgetting any major networks that air new holiday movies? I've gotten Ion, Lifetime, Hallmark, Hallmark Movies and Mysteries, and Up. Any others I should be on the lookout for? Be sure to also add Freeform and NBC to your list! Other stations, like Disney, INSP, and TBN sometimes have new movies, too. INSP won't this year, but maybe next year!